Conventional cancer treatments — chemotherapy, radiation and surgery — have prolonged or saved the lives of millions of cancer sufferers. Yet they are far from an ideal solution given the risks they pose and the damage they can wreak on the body. However, as biotechnologies advance, the therapeutic treatment of cancer is seeing enormous change. A number of emerging biotech companies are exploring options beyond the traditional treatments and early-stage shareholders are reaping the rewards. And if the success of other targeted therapy companies is anything to go by, PTX could be just around the corner from generating some significant market attention. With not one, but two novel therapies, PTX is ahead of the field in areas of high unmet need. Diversification here is extremely important and a key plank in its business plan. This offers multiple pathways to market, and mitigates the risk involved as its treatments progress through trials to market. Prescient’s flagship novel drugs, PTX-200 and PTX-100, work by inhibiting the survival pathways of growth molecules AKT (targeted by PTX-200) and Ras (targeted by PTX-100), which play a key role in the development and evolution of cancerous cells. The result is a turning off of the aberrant “grow” instruction typical of cancer cells. Adding credibility to the PTX team is the appointment of former Array BioPharma VP of Drug Discovery and Development, Jim Winkler as Chief Business Officer. Winkler, who has also held the roles of Chief Scientific Officer at Arvinas Inc (NASDAQ:ARVN) and Associate Director - Department of Oncology Research at GlaxoSmithKline (LON:GSK), will be in charge of drug discovery and oncology drug development, bringing significant industry experience to the role. In a positive sign for Prescient Therapeutics (ASX:PTX), the oncology space has seen plenty of merger and acquisition activity of late. 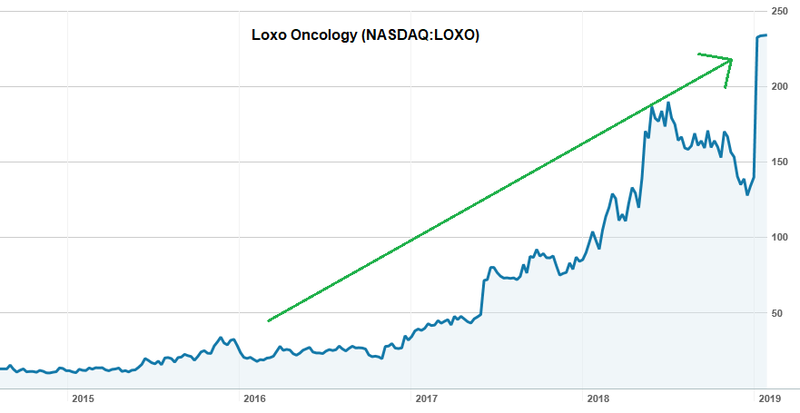 Take for example, Loxo Oncology Inc. (NASDAQ:LOXO) which developed a novel drug to treat a variety of tumours that share a rare mutation. The US FDA approved Loxo’s first commercial medicine in 2018, after which the company was acquired by US$23 billion-capped Eli Lilly (NYSE:LLY) for US$8 billion cash (US$234 per share) earlier this month — Eli Lilly’s largest acquisition in its 143-year history. 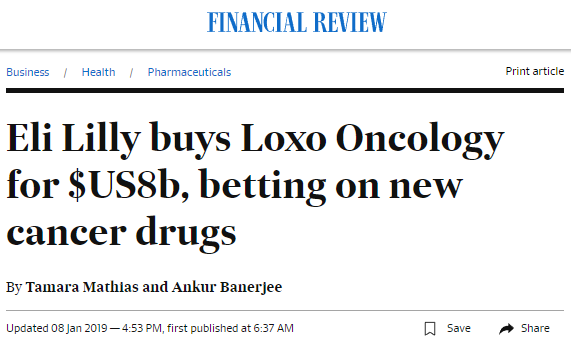 The turning point for Loxo came in June last year, when management presented at a cancer conference, reporting that its unconventional drug candidate, larotrectinib, had significantly shrunk tumours in 75% of patients with cancer in the lung, pancreas, colon or other locations. The company’s success with larotrectinib in the lead up to the acquisition, saw its share price rise well in excess of 1000% since 2016, culminating with news of the Eli Lily’s offer this January. The Loxo deal hasn’t been the only deal of late. As targeted therapies and immunotherapies continue to take the field by storm, Bristol-Myers Squibb last month announced its intention to buy Celgene Inc. for approximately US$74 billion in an effort to create a major pharma company with several hit cancer drugs. Meanwhile, the biotech space isn’t without failures. And it’s the ‘one-trick-ponies’ that are highly vulnerable, suffering the most when their single drug candidate is unable to weather the scrutiny of clinical trials. 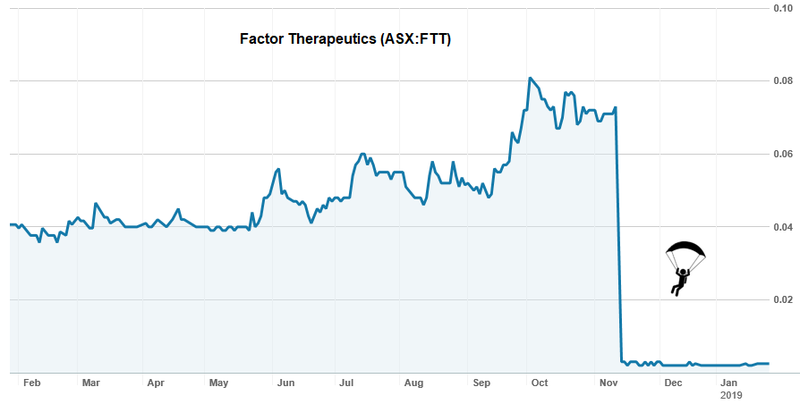 Factor Therapeutics (ASX:FTT) has been teetering on the verge of collapse since November after a failed clinical trial. FTT was testing its wound-dressing drug to treat ‘venous leg ulcers’, but the trial came back with a cataclysmic fail result, sending its share price plummeting by 97% to just $0.0025 ... and highlighting that it pays to be selective when investing in biotechs. Given that FTT was relying entirely on the success of one candidate, the company was decimated by the results, with shareholders headed for the door and management sure to be weighing up whether to fold entirely. This is a major factor that sets PTX apart. It has two drug candidates — PTX100 and PTX200 — with possible applications across breast cancer, ovarian cancer, AML, and solid tumours. It is also further expanding its pipeline with a collaboration with a US company to develop new formulations based on their knowledge of these drug targets. On that front, in early December the small cap released positive interim ‘durability data’ regarding its PTX-200 study in HER2 negative, locally advanced breast cancer. Responders demonstrated no disease progression; and partial responders also remained free of disease progression. Progression-free survival ranges from 22.8 months to 30.4 months, with an average of 27 months (which is the total time of the study thus far). 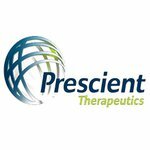 As for Prescient’s PTX-100, Phase 1 trials are complete and it’s due to re-enter the clinic in the first half of 2019. Interestingly, the company has flagged the possibility of advancing it through ‘basket studies’ of Ras and Rho mutant cancers, which could be transformative. Encouragingly, this ‘basket studies’ tactic — which can result in a ‘1 trial to launch’ process — was successfully employed by Loxo. A feature article in the prestigious industry journal BioWorld, Prescient plans basket approach to targeting range of cancers, favourably compared PTX to Loxo Oncology, noting that PTX is following the same development path that Loxo took with its basket approach to trials, rather than looking at specific indications for specific cancers. The article also highlighted excitement that biotech majors Roche AG and Astrazeneca plc generated about their Akt inhibitors last year and suggested that this could translate to increased attention on PTX. With its two candidates and soon to be four trials, Prescient is somewhat insulated from the shock of negative results in any one of these trials — which could be the difference between surviving or not, given the current landscape. The company is bringing a new sense of hope to the field with drug candidates that are intended not to directly remove or attack cancer cells, but instead provide selective support (or inhibition) of some of the body’s own cells in order to help a patient heal themselves. This can result in a stronger effect in mitigating cancer; and a lot less collateral damage inflicted on the patient’s body. None of the five responders in the Phase 2 component of the trial have had disease progression to date in follow up studies. Progression Free Survival (PFS), which is the time from the start of treatment until disease recurrence or progression, ranges from 22.8 months to 30.4 months so far, with an average of 27 months. Overall survival (OS), which is the time from start of treatment until patient death, exhibits the same average duration of 27 months as none of the patients have passed away. Patients with pathological complete responses (pCR) remain free of disease progression, but interestingly all patients that had partial responses (PRs) also remain free of disease progression after two years. These are all important markers of PTX-200’s efficacy, and importantly these effects are not limited to the short-term. Management also pointed out that Roche’s Phase 3 Akt inhibitor, ipatasertib, had demonstrated three things that were relevant to PTX’s drug platform. Firstly, the Akt pathway is activated in response to chemotherapy in breast cancer patients. Secondly, Akt inhibitors enhance the killing of breast cancer cells. Thirdly, and most significantly, this Akt inhibition results in clinical benefit for breast cancer patients. Ipatasertib is being tested in a different subset of breast cancer, metastatic triple negative disease, but relates to the same Akt pathway as PTX-200. In addition, Roche’s trials so far have shown that Akt inhibition can be of clinical benefit for breast cancer. PTX-200’s unique mechanism of action as a PH domain inhibitor may have advantages over other Akt inhibitors, because PTX-200’s unique mechanism appears to be hitting synergetic targets in addition to Akt that ipatasertib is not. Not just of ipatasertib fame, Winkler was also one of the main characters in LOXO’s larotrectinib story (in particular the drug’s early development). PTX appointed Jim Winkler as Chief Business Officer late last year to lead drug discovery and oncology drug development. It’s big news particularly because of the fact Winkler has worked with several big names in the field including Array BioPharma (NASDAQ:ARRAY) as VP of Drug Discovery and Development, Arvinas Inc (NASDAQ:ARVN) as Chief Scientific Officer, and GlaxoSmithKline (LON:GSK) where he was Associate Director — Department of Oncology Research. All in all, Winkler has 30 years’ experience in international biotechnology and pharmaceutical industry with a focus on oncology... what more could you ask for? Someone with that kind of CV brings valuable clinical experience to an early stage company, along with key industry connections and the potential to foster collaborations. Winkler joins PTX’s impressive talent pool which already includes Professor Jeffrey Lancet, who was the principal investigator on the highly-successful Celator (NASDAQ:CPXX) AML trial in 2016. It is companies like Celator which set a reassuring precedent for biotech juniors like PTX. The company soared to a $780 million valuation on the back of positive Phase 3 data in AML in March 2016, before being acquired by the privately held Jazz Pharmaceuticals in a $1.5 billion cash takeover. Lancet is also leading the PTX-200 for AML. It’s worth taking a look at the path of another company also developing a novel, non-conventional treatment for cancer — Viralytics Limited. Viralytics’ story took a fairly important turn last year, when it was bought by Merck & Co (NYSE:MRK) for $502.4 million, or $1.75 per Viralytics share —a 160% premium to the share price at the time. This deal went down with Viralytics boasting only one clinical oncology drug, CAVATAK® — its leading experimental product that uses a proprietary formulation of a common cold virus studied in multiple Phase I and Phase II clinical trials. Let’s zoom in for a moment on Sydney-based Oncosil Medical (ASX:OSL), which has a $107 million market cap. OSL is investigating the clinical benefit of the use of its OncoSilTM device for patients living with pancreatic cancer, in combination with standard of care chemotherapies. OncoSilTM is a ‘brachytherapy’ device that implants a pre-determined dose of beta radiation directly into cancerous tissue. The system is currently undergoing two clinical studies with the ultimate aim of progressing towards commercialisation. These trials are a stepping stone towards regulatory submission across key markets in Europe, the US, Australia and Asia. The company spent $5.78 million on R&D expenditure in FY2018, while in comparison, PTX has kept its costs to $2.06 million for the same period. It’s not hard to imagine a whole lot of upside in store for this small cap if current PTX-200 or PTX-100 trials play out as well as envisaged. At this stage in the game, PTX is in a truly unique position having two clinical cancer therapy candidates, with several possible pathways to market, and a market capitalisation of only $14.2 million. 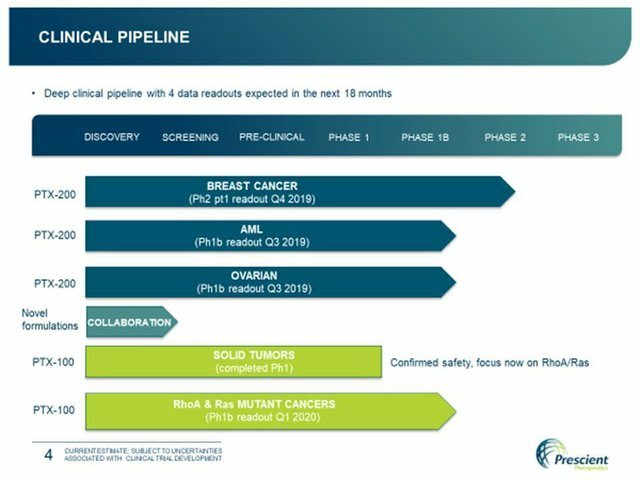 It looks to be a busy year ahead for Prescient, with its PTX-200 trials in breast cancer continuing in Phase II, and its AML studies and ovarian cancer studies to finish Phase 1b. It will also be going back to the lab with its PTX-100 candidate. That will make it four different trials, and four distinct opportunities for company-making news.